Avail from us superior quality Paecilomyces lilacinus which are basically filamentous fungus, used to kill harmful root-knot nematodes. These are formulated by our experts as per the varied requirements of the client. These belong to the family of Trichocomacea. Pacilomyces lilacinus is effective in plant parasitic nematodes. At GreenMax AgroTech, Pacilomyces lilacinus is available as talc based formulation with high density spore population. This product is also available as combined formulation with Beauveria bassiana. 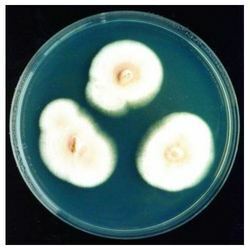 Mother culture of Pacilomyces lilacinus was sourced from Project Directorate of Biological Control (PDBC), Bangalore. Pacilomyces lilacinus, mass multiplied from virulent and pure mother culture is supplied as talc based formulation. The product will have a minimum population of 1x 107 (CFUs)/g. Talc carrier based product. The product has minimum shelf life of one year from the date of manufacture. The product is available in attractive one kg laminated poly pouches. The packing is moisture and proof and well tolerates transportation and handling. The product is also supplied in bulk packing of 50kg/25 kg sizes in HDPE bags. Paecilomyces lilacinus is a common saprophytic, entomopathogenic, mycoparasitic, saprophytic, as well as nematophagous, filamentous fungus. It is parasitic on nematodes infecting eggs, juveniles, and adult females of root-knot and cyst nematodes. The species can grow at a wide range of temperatures – from 8°C to 38°C for a few isolates, with optimal growth in the range 26°C to 30°C. It also has a wide pH tolerance and can grow on a variety of substrates. P. lilacinus has shown promising results for use as a biocontrol agent to control the growth of destructive root-knot nematodes. Paecilomyces protects the roots against plant parasitic nematodes, specifically root-knot nematodes (Meloidogyne spp. ), Banana nematodes (Radopholus similis) reniform nematode (Rotylenchulus reniformis), and citrus nematodes (Tylenchulus semipenetrans). These nematodes infect horticultural crops of economic importance. Soil application: For one acre mix about 3 kgs of Gmax Bioguard with 100 kgs of compost, keep the mixture under shade with sufficient moisture content (30%) for one week time and broadcast in the field. Pit application: For plantation crops like Banana, sprinkle 25 grams of Gmax Bioguard in the pit before planting. After planting, about 25 grams of Gmax Bioguard can be mixed with compost and sprinkled around the tree trunk in the soil. Vegetable crops and horticultural crops and plantation crops like Banana. Using the product after severe nematode incidence may become ineffective. Looking for Paecilomyces Lilacinus ?